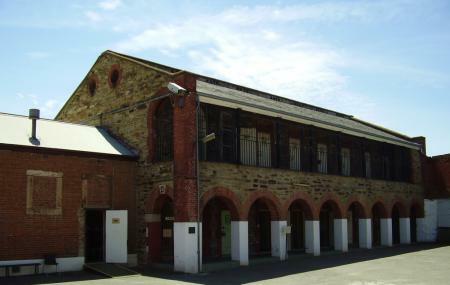 One of Australia’s longest operating prison facilities, The Adelaide Goal ran for 147 years from 1841 to 1988. A major landmark in Adelaide’s heritage, the goal is one of the oldest public buildings in the city. A walk through the goal area offers a glimpse into the life of the former inmates and their notorious past. There is also an interactive exhibit that is interesting and informative. You can also touch numerous artefacts and even try on handcuffs and leg irons. The goal was the sight for hangings and is rumoured to be haunted by the ghosts of inmates and former wardens. Notable “ghosts” are Fredric Carr, Governor William Baker Ashton & Ben Ellis - the hangman. One can also visit the graves of prisoners buried around the goal premises. Visitors will also find the architecture of this 19th century building interesting as well the archaeological dig at the goal that revealed that it was a early white settlement. Shaded picnic areas and wheelchair access are available. There are currently no guided tours for this attraction. Family (2 adults and 2 children OR 1 adult and 3 children) -$34.00 AUD. Group entry - adult (minimum of 10 people)- $12.00 AUD. Group entry - child (minimum of 10 people)- $6.00 AUD. Last Entry at 3.30 pm. Bus Stop: Bus stop 1 on Port Road. Tram Stop: Corner of West Terrace and North Terrace or adjacent to George Street, Thebarton. How popular is Adelaide Gaol? People normally club together Art Gallery Of South Australia and River Torrens Linear Park Trail while planning their visit to Adelaide Gaol. Enjoyed our experience of the prison and it’s history. Staff were really helpful and informative. A little disappointed some of the prison was out of bounds due to a private function and this didn’t reflect in the cost of admission. If you’re missing a third of the prison it should be reduced by a third. Seems fair. Had a great family trip. A special "Escape the gaol" puzzle trail was on which the kids loved. And we adults found the history, stories, and exhibits fascinating. Wonderful staff too. Great Ghost tour. Well worth the visit. Fantastic guide. Great stories and excellent knowledge. Interesting experience. The models leave a little to be desired but the audio guide is well done and really informative.